First some background: The Masked Rider was a pretty long-running character in the Western pulps. Novels featuring him, in magazines from two different publishers, appeared for almost twenty years. More than likely, the character was created to cash in on the success of the Lone Ranger on radio. He was also a masked rider of the plains (hence the name) and had a faithful Indian companion, in this case the Yaqui known as Blue Hawk. Because he wore a mask, folks often mistook him for an owlhoot, and he was sometimes known as the Robin Hood Outlaw. But of course the Masked Rider was a good guy, using that unsavory reputation at times to help him foil the schemes of the real villains. In the early issues of the pulp published by Ranger Publications (another nod to the Lone Ranger), he was more of a Shadow-like figure, a mysterious, black-caped personage prone to manipulating events behind the scenes. When the magazine became part of the Thrilling Group, the novels became more action-oriented and less mysterious, but the basic set-up remained the same, with the Masked Rider and Blue Hawk drifting from place to place, righting wrongs. One thing that made the Masked Rider different from the Lone Ranger was that he had a secret identity of sorts. The Lone Ranger would sometimes masquerade as other characters, but the Masked Rider spent a considerable amount of time in each adventure posing as drifting cowpoke Wayne Morgan. Note that Wayne Morgan wasn't his real name; that's just a fictional identity the Masked Rider made use of. His real name and background is never revealed in the stories. My introduction to the character came not from the pulps but rather from a series of paperback reprints published by Curtis Books in the late Sixties and early Seventies. Quite a few (but by no means all) of the novels from the Thrilling Group incarnation of the pulp were reprinted. I had a bunch of them and read quite a few of them, but it had been a long time since I'd tried one of the Masked Rider's adventures. 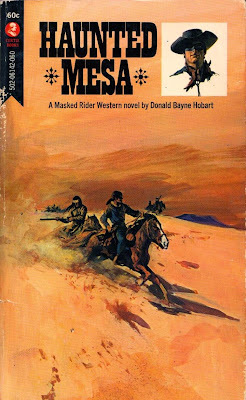 I have a few of them on my shelves now, and the other day Donald Bayne Hobart's HAUNTED MESA seemed to need me to read it. This one originally appeared in the January 1942 issue of MASKED RIDER WESTERN, and you can see that cover here on the blog tomorrow as part of the Saturday Morning Western Pulp series. I'm writing about the book today because I read the paperback edition. (I don't own a copy of the pulp.) This one has a nicely atmospheric opening as several cattlemen are about to lynch the man they believe to be the leader of the rustlers who have been plaguing the Haunted Mesa country. They're jumped by the rustlers and might be wiped out except for the timely arrival of the Masked Rider and Blue Hawk, who happen to be on top of the mesa itself. The "leader" of the rustlers gets away, but the reader knows all along he's not the actual villain. He's been framed for the crime by the mastermind who's really behind the gang, and the identity of that mastermind couldn't be much more obvious if the guy was wearing a neon sign proclaiming his evilness. But you know what? I don't care. The real fun of a book like this is reading about how the Masked Rider foils the various schemes of the bad guys, racing around having gunfights and fistfights, getting captured, escaping, and generally being the stalwart pulp hero that he was for many years. This is pure entertainment as far as I'm concerned, comfort reading, if you will, and I enjoyed the hell out of it. A few words about Donald Bayne Hobart: Surely forgotten these days except by a few pulp aficionados, not much is known about Hobart. He was born in 1898 and started writing when he was around 20 years old, but he didn't become a prolific pulp author until the late 1920s, when he began writing for numerous pulps in various genres. By the late 1930s, he had settled into a niche as a productive author of Western and detective stories, nearly all of them appearing in pulps from the Thrilling Group published by Ned Pines and edited by Leo Margulies. Hobart kept turning out stories until the mid-Fifties, usually under his own name and sometimes under the rather transparent pseudonym Hobart Donbayne. He published a few late stories in the mystery digests and died in 1970. Even though Hobart's name appeared frequently on the covers, I don't think anybody ever considered him to be more than a competent, third-tier pulp writer. I never did, although honestly I'd never read more than a few of his stories. Based on HAUNTED MESA, though, I may have underrated him a little. This is a nicely written yarn with good action scenes and the occasional atmospheric touch, as I mentioned above, including a final battle on top of the mesa during a thunderstorm. Sure, there's a lot of "yuh mangy polecat" dialogue, but you've got to expect that. Good solid work all around, certainly good enough to make me think I need to read more by Hobart. I have another of his Masked Rider paperbacks on hand, as well as stories by him in various Western pulps. Finally, about Curtis Books: The company lasted only a few years, but during its run it published quite a bit of good fiction, including a lot of reprints from the Rio Kid Western pulp and a number of Mike Avallone's Ed Noon novels, both reprints and originals. (The first Curtis Book I ever bought, off the spinner rack at Trammell's Pak-a-Bag Grocery, was Avallone's SHOOT IT AGAIN, SAM.) They've come to be notorious for producing some of the cheapest, most shoddily made paperbacks of all time, however. The pages in my copy of HAUNTED MESA are as brown as if they had come from the original pulp itself. Luckily, they're not very brittle. And in even more of a surprise, the glue has actually held up in this copy, so the pages didn't separate from the spine. I've seen that happen time and time again with Curtis Books. Copies of the Masked Rider paperback reprints can be found on-line, but they're fairly pricey, maybe because not all that many of them survived. If you can put yourself in that pulp mindset (I live in that pulp mindset, most of the time), they're a lot of fun. If you run across any of them that aren't too expensive, I think they're worth picking up and worth reading. Never heard of Hobart. I'll be watching for him. I love that stark cover. Reminds me a little of the Bama covers from the 70's. I'd definitely like to read this. Gonna see if I can find it. It sounds like a lot of fun, James. I'll keep an eye peeled (well, not literally) for this or other Masked Rider books at the usual venues. I've read a book where he's just named as Bayne Hobart. This book looks really good. Now I'm going to have to track a copy down. Very well-researched piece! I have a few MASKED RIDER pulps around here and based on your recommendation I'll take a closer look. Every time I see one I'm irresistibly reminded of Lenny Bruce's classic "Thank You, Masked Man" routine. Just started reading this today after picking up a copy in fantastic condition at Half Price Books for $2. 75 pages in and it's surprisingly really good. DBH was also prolific writer of comic book filler stories for the Pines comics. We wrote Westerns of course and kid detective storiesxabout a kid naked Herbie Johnson. He also wrote funny animal and romance. I always find him entertaining no matter the publication.